Eating – Averie continues to impress us with how much milk she can put down in a day. Obviously, she’s getting enough to eat as evidenced by her many arm, belly, back and leg rolls 🙂 Aaron was a pretty lean infant, so I’m totally enjoying having a Michelin tire baby. One wrinkle in all this was that she suddenly started to refuse the bottle around week 9…right before I was supposed to return to work. This caused a lot of anxiety and frantic web researching and I tested out a couple of different bottles to see if they;d make a difference. She’s now taking the bottle, though reluctantly. Bouncing gently on the exercise ball and using the Tommee Tippee bottle seems to help. Sleeping – Nighttime sleep is still pretty good. We’ve gradually moved her bedtime earlier and earlier, and her bedtime throughout month 3 was typically 7:30pm. Just 2 days ago, I experimented with moving it even earlier, and I’m happy to say that now she goes down at 6:30pm! Unfortunately, daytime naps are still a struggle. All the activity during the holidays made it difficult to establish a regular naptime schedule so her naps are still all over the place. I just started her on a schedule in the new year so hopefully this will help get her to nap longer and more regularly. 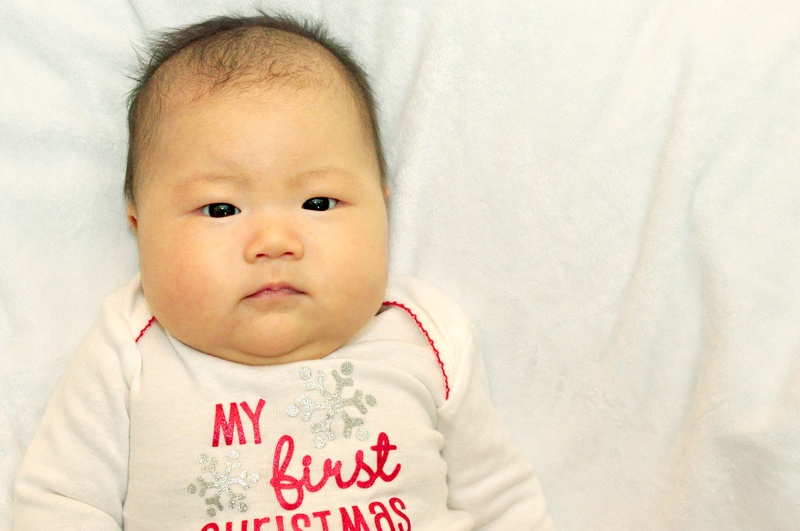 Playing – Averie definitely became much more alert and aware of her surroundings this month! I think she recognizes who mommy is since she thrashes her arms and legs more energetically when she sees me. This month was also the first time we saw “real” smiles, starting around week 10. She’s a big coo-er and talks a ton when she’s awake. It’s so cute I can’t stand it! Returning to work – the last 2 weeks of maternity leave were so bittersweet. I dreaded leaving my baby even though I was able to reduce my hours to 4 days a week plus I can work from home 2 days/wk as well. I think it was just the idea of not being home with her all day like I was used to. It’s funny because I was itching to get back to work when Aaron was this age, and now looking back I regret not truly enjoying those first few months with him. Luckily, I only had to go back for a week before our school closed for winter holidays, so I got another week and a half off before heading back. I think both kids sensed something was off that week because Averie woke up 2+ times each night and Aaron’s been crying out in his sleep. Needless to say, I didn’t get much sleep that week, which probably contributed to the cold I caught that’s still lingering to this day. Month 3 was full of developmental milestones and changes. It’s so crazy to think that a quarter of her 1st year is already over! This entry was posted in baby, musings and tagged 3 month update, baby, infant, Parenting, working mom on January 5, 2013 by Jessica.